Springfield… State Representative Tom Demmer (R-Dixon) released the following statement in response to the passage of Senate Bill 2814 in the House this evening. This bill would keep providing reliability and consistency with the State’s policy on nuclear energy- including keeping nuclear generation plants open at Clinton & Quad-Cities. “I voted ‘Yes” because I support nuclear power as a clean and viable energy source. I know first-hand the value of both nuclear energy and nuclear energy jobs with the Byron Nuclear plant in my legislative district. 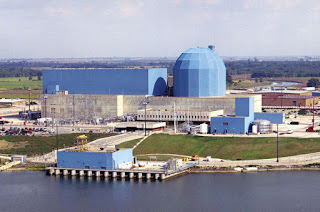 Nuclear energy generation creates hundreds of jobs and millions of dollars of revenue for both the State and local communities where those jobs are located,” said Demmer. “If these two nuclear power plants were to close, Illinois ratepayers would be paying higher rates and receiving less reliable power in return. This bill was negotiated with a variety of stakeholders and provide reliability and consistency for the next decade,” continued Demmer. SB2814 passed the Illinois House on a vote of 63-38.